You can scratch away your travels on Platinum foil, gold foil, silver foil, and now you can scratch ROSE GOLD foil. Flamingos, watermelon, strawberry jam – all the best things are pink. And whilst the Scratch Map Rose Gold Edition might not be quite the neon tropical end of the spectrum, we much prefer our Scratch Maps to have a subtle, sophisticated aesthetic. 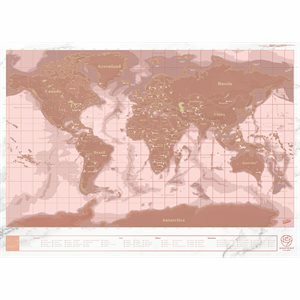 Speaking of sophisticated, the Scratch Map Rose Gold is our first ever map to feature a marble effect. Off-set by the pastel based underlay colours, once you start scratching, you’ll be treated to baby blues, lilacs, and peach.